Chennai: In the case of the medical student that allegedly died of an anaesthesia overdose during a hair transplant, the Madras High court is reported to have pointed serious questions to the central and the state government with respect to the Clinical Establishment Act. In particular, the court has asked the government to enact appropriate legislations to regulate new type of clinics, including hair transplant centres, beauty clinics, studios and spas. Vijay Narayanan, senior counsel for the petitioner, submitted that other than registering under the Tamil Nadu Shops and Establishment Act and obtaining licence under Section 287 of the Chennai City Metropolitan Corporation Act, 1919, no other compliance was required under law. He said the “Tamil Nadu Legislature passed The Tamil Nadu Private Clinical Establishments (Regulation) Act, 1997 for regulation of the private clinical establishments in Tamil Nadu. As the rules were not framed by the State Government, the Act has not come into force till date”. He said similarly, the Parliament passed The Clinical Establishments (Registration And Regulation) Act, 2010 for registration and regulation of clinical establishments in the country. The judge observed that even after enacting The Tamil Nadu Private Clinical Establishments (Regulation) Act, 1997, successive governments had not framed rules for the past 19 years and hence the Act has not come into force so far. Justice N. Kirubakaran said “when existing laws are not capable of regulating them, State legislatures and Parliament have to take into consideration of the present day scenario and pass appropriate new legislations to cope up with the developments”. 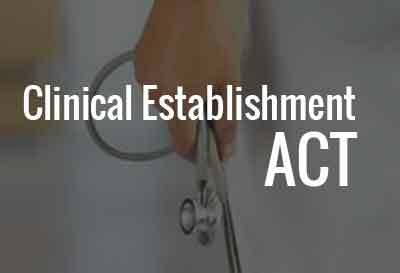 As per section 8 of the Clinical Establishments (Registration and Regulation) Act, 2010, the State Governments are directed to constitute a State Council consisting of more than 10 members and levies penalties contemplated for violation of the said Act, including closing down of the said establishment. However, the court observed that this had not been done by the government till now and the present case established a lack of follow up action by the State Legislature after enactment of The Tamil Nadu Private Clinical Establishments (Regulation) Act, 1997, by framing Rules to enforce. As a result, the Act has not come into force for the past 19 years. Q When the Tamil Nadu Private Clinical Establishments (Regulation) Act 1997 passed by the Tamil Nadu Legislative Assembly on 14.02.1997, why the successive state governments have not framed the Rules, so that the Act could come into force? Q In the absence of any state Act and when Parliament passed a comprehensive Legislation – The Clinical Establishments (Registration and Regulation) Act, 2010, why the successive state governments failed to adopt the Act? Q When the present case itself made the Karnataka Government to enacted Karnakata Private Medical Establishment (KPME), why the state government had not enacted a similar Act? Q When will the state Government come out with either a new comprehensive legislation or adopt the Central Act? Q Whether the duty of Union Government ends with passing of “The Clinical Establishments (Registration and Regulation) Act, 2010” especially all the states except four states failed to adopt the Central Act ? Q Is it not the duty of Central government to follow up the issue to see that state government adopt the Central Act, if not, to pass a new Act ? Q Why not the Central Act develop a suitable mechanism/system in the public interest, to remind about the necessity to pass legislations by states regarding state subjects in case of necessity or if a new situation arises warranting new Act without infringing powers of the states ? Q Why not Central and state governments form permanent high-level committees to take note of the happenings in the society regularly and suggest suitable enactment of new laws, if there are no laws to deal with new situations or to amend the existing laws to be more effective to deal with any lacunas in the act, without waiting for court directions was done in Vishakas’ case (Sexual harassments in work place)? Q How many complaints have been received by the authorities alleging negligent act by clinics, beauty clinics and spas in the state? Q What are all the steps taken by the state government on the complaints? In the West Bengal Clinical Establishment Act is in force since 1950. Even then you may not find any significant judgment of Kolkata High Court related with CEA, though the WB probably tops the list as far as the cases of medical negligences are concerned. Neither the victims of medical negligence nor the lawyers of the Kolkata High Court are much aware of the power of this act. This I discovered only after loosing my brother to the apathy of doctors of one of the best clinical establishments of Kolkata and pursuing the legal battles for the justice thereafter. You have very affordable relief under the Consumer Protection Act. Did you avail of those remedies. Thank you Mr Gupta for your response. I have already done that. But I am looking much beyond this. The biggest ever award for medical negligence in India was given under the Consumer Protection Act. The matter went right up to the Supreme Court of India. Maharastra has a Clinical Establishment Act. But really its not workable in a place like Mumbai. It specifies the size of individual dispensaries, etc. etc. which are not possible in the city. If the Govt. really applies the law almost 50 % of the small dispensaries would be closed down. This is a good move and I guess it is under consideration.